Goldsmiths Teaching & Learning is created by the Teaching and Learning Innovation Centre (TaLIC) in collaboration with Educational Studies. It is designed on the principle that the knowledge Higher Education institutions produce is, and ought to be, public good. The site design is organic and bottom-up. Content is defined by contributions which are open to all Goldsmiths teaching staff and PhD students. Our goal is to contribute to open access to knowledge in Higher Education and encourage a culture of openness and constructive debate on pedagogical theory and practice. We support “free, unrestricted access to knowledge and information, as well as collaborative or cooperative management and decision-making rather than a central authority” (https://en.wikipedia.org/wiki/Openness). 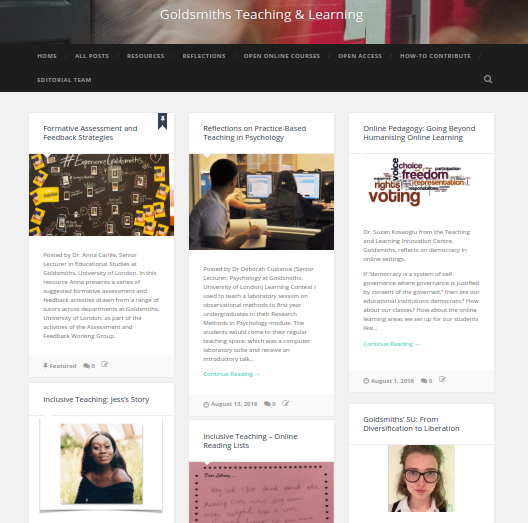 Goldsmiths Teaching and Learning website. 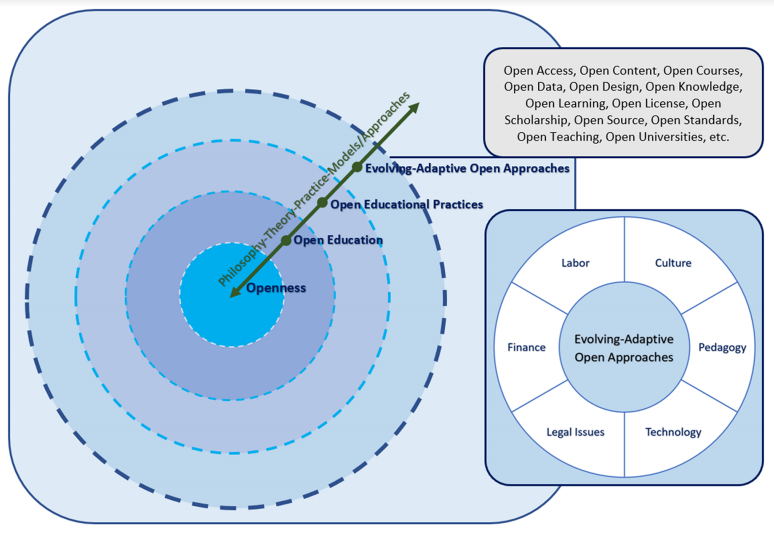 We used the open educational practice model (Koseoglu & Bozkurt, in press) in the site design, which starts with a philosophy and vision of openness in connection with broader open education initiatives and movements. We then established the kinds of open practice we wanted to highlight on the site (in our case these were open content, open knowledge and open courses). The six dimensions of open practice (i.e., labor, culture, pedagogy, technology, legal issues, and finance) were particularly helpful in determining the workload and available resources, and making the site an extension of the unique culture of teaching and learning at Goldsmiths. We kept the site design flexible and responsive to readers’ interests and types of contributions. A framework for open educational practice. Taken from Koseoglu, S., & Bozkurt, A. (in press). An exploratory literature review on Open Educational Practices, Distance Education. The project is in its early stages. A crucial step moving forward is exploring how the site can become a place for pedagogic engagement and a way for people to learn more about open licenses and sharing for public good. We welcome your suggestions on the site design. Suzan Koseoglu: I’m an Academic Developer at the Teaching and Learning Innovation Centre, Goldsmiths, University of London (www.gold.ac.uk). I teach on the Postgraduate Certificate in Learning and Teaching in Higher Education programme, which is designed to enhance the pedagogical practice of staff and PhD students involved in teaching at Goldsmiths. I also work on college-wide projects and initiatives related to pedagogy. My research focuses on open online learning, in particular the nature of open scholarship and the interplay of power and pedagogy in hashtag communities. I’m on Twitter: @SuzanKoseoglu, and occasionally blog at differentreadings.com. Debbie Custance: I’m a Senior Lecturer in Psychology and the Academic Director of Goldsmiths’ Teaching and Learning Innovation Centre (TaLIC). I have pursued two main areas of research: socio-developmental comparative cognition and the dog-human bond. I studied cultural learning in human adults, typically developing children, autistic children, chimpanzees, orang-utans, pig-tailed macaques, capuchin monkeys and ring-tailed lemurs. I’m a recipient of the David Peake Award for Excellence in Teaching and Learning and have three times been shortlisted for the Student Unions’ Student-Led Teaching Awards. This work by Suzan Koseoglu, Deborah Custance is licensed under a Creative Commons Attribution 4.0 International License.